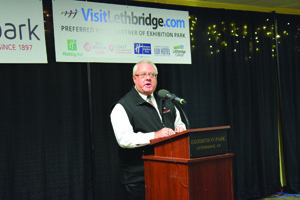 Exhibition Park announced last Wednesday that it has entered into a major strategic partnered with the Lethbridge Lodging Association. In a media event announcing the partnership, Doug Kryzanowski, marketing manager for Exhibition Park, said it would develop a base to establish Exhibition Park as a major meeting and conference facility in Southern Alberta, the LLA Member hotel properties and Lethbridge as a destination. “It allows Exhibition Park to promote our current facilities, and potentially a new facility in the future,” said Kryzanowski. Exhibition Park’s six buildings — Heritage Hall, West Pavilion, North Pavilion, South Pavilion, Main Pavilion and the Saddle Room — currently hosts over 1,550 rental nights per year with more then 570 clients. Kryzanowski said that when planning conferences, planners are often looking three to five years out, something they had been remiss in catching. Noting that the competition is “quite fierce across Canada”, Kryzanowski said that Lethbridge could market itself as an affordable conference city, and they hope to get other properties involved. “Our message going forward to conferences across Canada, will be we are in the business, if you will,” said Kryzanowski. LLA is an association of Lethbridge accommodation properties working together to increase overnight stays for member properties, and aims to strengthen the Lethbridge economy by partnering with and collaborating closely with organizations to create new and sustainable tourism opportunities. “Our main mandate is to market Lethbridge as a destination and Lethbridge Exhibition is a fantastic partner because we align in terms of wanting to bring leisure, as well as corporate visitors to town,” said Shilpa Stocker, project manager for the LLA. Stocker said the area had a lot going for it, given the traffic at the Lethbridge Airport and new potential facilities at Exhibition Park, leading LLA to decide formalize a three-year strategic partnership with Exhibition Park so they could take advantage of what Lethbridge has to offer. Exhibition Park will be crossing over their events and social media to LLA’s website, visitlethbridge.com, which allows visitors to book hotel rooms online, view a list of activities and events to attend and get information about Lethbridge as a destination.